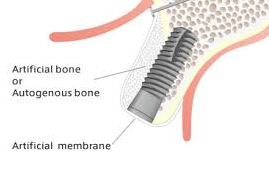 In order for the dental implant to integrate with the bone(fuse, bond with the bone), it has to be surrounded by a layer of bone of at least 1.5 mm. Sometimes, some patients do not have enough thickness of the bone to ensure that the implant is completely surrounded by bone. Photo showing the dental implant being partially covered by native jaw bone and partially by bone graft protected by a membrane. This is why the idea of bone graft came around. It also called bone augumentation, which is increase in size or volume(does not have anything to do with the antibiotic Augumentin). After a tooth is extracted the alveolar bone(the part of the jaw bone in which the roots of the tooth are embedded resorbs because it does not have a function anymore). When the alveolar bone resorbs, it becomes smaller in height and width. The rate and speed of resorbtion depends mainly on how much infection the extracted tooth had before extraction, how traumatic the extraction was, the health status and the genetic biotype of the patient. If a dental implant is planned to be placed in the spot of a tooth that needs to be extracted, the best way is to place it during the same visit to avoid the bone resorbtion. Once the implant is placed in the “hole” where the tooth used to be, it prevents the resorbtion of the alveolar bone. Not all implant types can be placed immediately after extraction. Only the ones that are designed for immediate placement. The picture shows a narrow bone left after extensive resorbtion that would not be appropriate in order to place an implant. 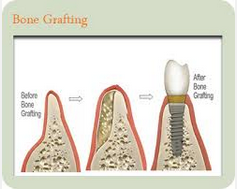 The Procedure of Bone Grafting consists of adding the patient’s own bone shavings, cadaver bone or synthetic bone. It is covered then with a membrane and the gums. It takes around 6-9 month to completely heal. Instead of putting any foreign particles in the patient body, my preferred method is to use the the patient’s own bone to compensate for the lack of width or height of their existing bone. It just takes a little more care and work when preparing the site for the implant in order to save each piece of shaved bone, but at the end it gives us the piece of mind that nothing foreign was introduced in the body and also the best grafting material was used(the patient’s own bone). One very specific type of bone graft is the sinus lift. I will go into details about that in my next blog. If you have any questions about bone grafting, sinus lifts, dental implants or any other dental questions, please call my dental office in South Jersey, Sewell Dental Arts for a free consultation. I will be happy to meet you and help you.